The story behind the chess board provides a graphic demonstration of exponential growth. It is interesting that Moore’s law reaches the second half of the chess board in 2013. The true story behind the invention of the chess board has been lost in time. The story goes that the inventor of chess, a mathematician, showed his creation to his country’s ruler. The game introduces the king and queen, knights, bishops, castles and the pawn representing the serfs of the nation. It demonstrated the importance of all members of society. The emperor was so impressed he offered the inventor a reward of his choosing. The mathematician, asked that one grain of rice be placed on the first square of the board and that he be doubled on each subsequent square. The emperor protests, believing that the reward is too small – but the mathematician persists. When they reach the 32nd square, the reward amounts to the production from a few acres of rice patties- significant but not unreasonable. By the 64th square, it is estimated that the total amount of rice would amount to a pile the size of Mount Everest. This is a simple but dramatic explanation of a geometric series. The second half of the chessboard is a phrase coined by Ray Kurzweil an American author, inventor, futurist, and a director of engineering at Google. The key point being that once you reach the second half of the chessboard, changes are exponential. Each new square doubling that of the previous. In a 1965 article in Electronics Magazine, Moore noted that the number of transistors in a minimum-cost integrated circuit had been doubling every 12 months, and predicted that this same rate of improvement would continue into the future. The law was modified slightly to 18 months. 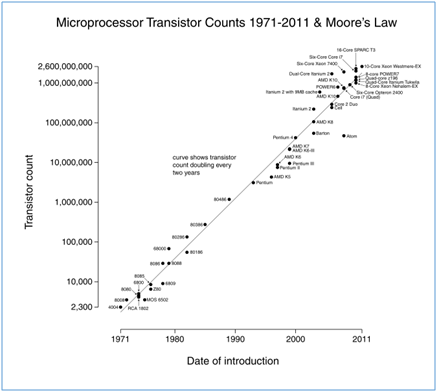 You can see the geometric pattern to Moore’s law in this chart. What is significant is that Moore’s law technically entered the second half of the chess board in 2013! The implications are profound and they are all around us. Every day we are using the Google search engine, Google maps, social media and the list goes on. This functionality was only a dream a short 10 years ago. Google Glass and the Google Driverless Car are only small, incremental examples of what we can expect in the near future. What is the impact of these changes on the economy? I recommend that you read Race Against The Machine by Erik Brynjolffsson and Andrew McAfee. This entry was posted in Technology and tagged moores law, race against the machine, ray kurzweil, second half of the chess board. Bookmark the permalink.